In an effort to keep this here blog of mine going I’ve decided to try something a little different. They say that we learn something new every day, and today I found that to be exceptionally true. In fact, I started compiling a list in my head while on my drive to work and only found myself adding more things to it, so that didn’t really go as planned. I’m not very good at mental note-taking so I tried my best to remember what it was I had thought of and haphazardly typed it into Word while on my break at the office. And now I present today’s list. 1. People still use CDs in their cars. Shocking, I know. But I was reminded of this when I drove past a guy who had a Case Logic visor CD organizer that was filled with purchased CDs and burned-at-home CD-Rs. It all seemed rather ‘90s since my last two cars have had USB ports and my music has either been on a thumb drive or smartphone ever since. I’m not a big terrestrial radio fan and am a proud Spotify Premium subscriber so my music collection had been downloaded from there and is all on my iPhone. Also, Ann’s car doesn’t even have a CD slot – all music is played via Bluetooth or USB port. 2. The local daily newspaper now costs $1. There was a time when I had to scrape together four quarters to buy the Sunday paper in order to get all of the retail ads and coupons. The daily cost a fourth of that. But as with everything, technology has just about killed this format. Coupons and ads can now be seen online and with Amazon, you don’t really need ads anymore because chances are they have what you need for less and will ship it to you for free. Then why did I even bother buy a newspaper today? The Long Beach Grand Prix is approaching and there was a voucher for a free Friday ticket in today’s edition. That’s the day that the office sort of takes a rather long lunch since the event is literally across the street from us. So spending the $1 was well worth it. Any other day? Not so much. 3. Water refill stations still exist. 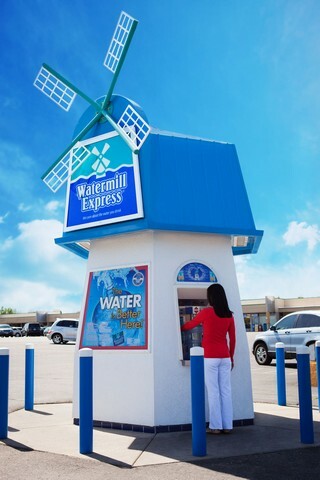 Whether they are against the wall of the local Walgreens or fancy stand-alone jobs that look like a windmill, they are still around and people still use them. I found this out while researching them since we are in the market to have water delivered to us. I am still not drinking [diet] soda regularly, although there have been a few occasions while dining out when I did get one as a treat. Water is still my mainstay and I have an app to remind me to reach my daily goal of 100 oz., so I figured that having it delivered might be cheaper than buying a case of bottled water at the store. At $1.50 for five gallons from said refill stations, it probably will be. And while I don’t buy soda anymore, I have found a tasty substitute should I crave something bubbly. Highly recommended if you can find it in your area. 4. Domino’s pasta bowls are carb overload. This one may seem a bit obvious but I learned the hard way. Ann ordered three of them last night for dinner and being as hungry as I was when I got home from work, I devoured mine in no time. The bad part: I wasn’t running a marathon today. If I had been, the combination of pasta and pizza crust would have been an excellent source of fuel to burn off. Instead, they sat in my stomach all day and magically turned into sugar as they tend to do if you don’t use them. It was total carb overload, and I felt it all day long. Pretty stupid move. 5. Vans never go out of style. Last week we took Anthony birthday shopping at the local outlets. He loves Vans and has a pretty decent collection of them. In fact, his love ignited mine and I started to build my own collection which includes a pair inspired by The Beatles’ Yellow Submarine (that I will never wear). I wore Off The Walls all the time as a kid – when we could afford them – so wearing them again on a regular basis is fun, and it doesn’t hurt that I can wear them to the office. I have an assortment of colors to choose from but I made a purchase at the outlets last weekend that I won’t soon regret. Depending on your monitor calibration, the brightness of your smartphone screen or any other number of factors, these Old Skool style Vans are bright pink with the signature Vans stipe running the sides in cyan. For $20 and 50% off a second pair, I couldn’t pass them up. They are a hit, inside the office and out. I actually had a guy stop me while I was on my bike ride to tell me how much he liked them and today while returning from a Starbucks run with a coworker, someone else walked past and complimented me on my choice of footwear – only I was wearing these instead. These are all purple with gold eyes. I also have pairs in dark green and blue, and I dig them all. All this admiration just goes to show that Vans are timeless and at least in their birthplace of southern California, they are more of a lifestyle than anything. What will I learn tomorrow? Who knows. But I hope you enjoyed the list of things I learned today. Is Amazon Serious About Prime Air? I had to check my calendar when the story first broke yesterday. Yes, it was the 1st of the month but alas, the month of December not April. Yet I still thought this was a joke. In case you missed it, Amazon announced that it had tested a new form of package delivery they call PrimeAir which promises to have your package – maximum weight of 5 pounds – at your door within 30 minutes of ordering. Kind of like the Dominos Pizza of online merchandise delivery. The difference is this: while Dominos relies on a driver’s high-mileage 1999 Toyota Echo to get your bland pizza to your door, Amazon plans to enlist the help of drones (see photo) to carry package. Here’s the video of how it would supposedly work. And here’s where the problems begin. I’ll go over a list of five things that I immediately thought of when I heard of this gimmick. Have you ever tried to fly one of these things? My neighbor’s son had an AR Drone and all I remember seeing that thing do was crash into things – and hard. Granted, the ones Amazon shows being used in the video are nothing like the aforementioned models but still, I would imagine controlling one of these things would require patience and a good amount of training in order to have them fly safely. And take a look at the photo above. Do you see what I see? Something along the lines of exposed rotor blades? Remember that scene from Raiders of the Lost Art when Indy is fighting the guy near the plane? Perhaps things may not get that graphic but all I’ll say is kids and animals can be very curious. Let’s face it, not everyone is as sane as you or me. So let’s say Amazon ultimately decides that this is a grand idea and rolls it out to a few test markets. Who’s to say that said crazy people wouldn’t take it upon themselves to try and bring the drone down by whatever means possible? Idiots still shine lasers at incoming passenger planes so why wouldn’t they roll the dice and try their luck with a mystery 5-pound package? It could be anything from an iPhone to Q-tips. Then again, the seriously crazy people wouldn’t care about the package as much as they would reeking havoc on a remote controlled flying gizmo. It would be like the head of a trophy buck to them. Like mostly everything these days, a drone is a computer. On top of that, it’s got wireless receivers and transmitters on-board. It’s possible that these things could be hacked and the package delivered to someone other than the intended recipient. While I’m sure GPS will play a huge part in tracking the devices, I’m also quite positive a hacker could make the drone forget where it was last. While there is a weight limit to the packages that the drones can deliver, things can still go wrong. Suppose the battery suddenly goes dead or is starting to die and the drone begins to lose its power, the same power that probably controls the arms that hold the package firmly in place. If those arms suddenly begin to grow weak then there goes the little orange box. Watch out below. And hey, who’s to say that the aforementioned hackers wouldn’t do this very thing just for fun? Or what if the drones encounter bad weather that blows them off-course? So, so much that could go wrong. Problem 5: Is This Even Feasible? I’m not sure how many distribution centers Amazon has or how many markets they plan to roll this out in but it just doesn’t seem to make economic sense to invest in these delivery drones. We’re talking about delivering packages weighing under 5 pounds here. If someone ordered something they needed in 30 minutes, you can bet it probably wasn’t anything of significant value – or could it be? Either way, it doesn’t make economic sense to me, and that’s not even factoring potential item returns into the equation. So Amazon, you got us. Your little delivery “innovation” seems like nothing more than a pipe dream or, which is most likely the case with Christmas shopping in full swing, free publicity by generating a buzz that included your name. It could just be nothing more than a commercial for the online merchandising giant. We’ll see what eventually goes down in a few years but as for me, I just don’t see it happening. And if it does, I’m buying a hardhat. UPDATE 12/3/13: That didn’t take long. Now UPS is in on the action? When will FedEx and the others join? People love their bargains and we’re no exception. We’ve used sites like Amazon Local and Groupon to snag some fantastic deals in the past and all of them were handled the way we expected them to be. And the deals are usually comprised of the same formula: get $[retail amount] of merchandise/services/food for $[discounted amount]. Easy. Past deals I’ve bought have included $40 worth of Restaurant.com credits for $10, $30 towards the purchase of Dodgers tickets for $7, and $5 for a $10 Amazon Gift Card. No doubt they were fantastic deals. You pay a discounted price and get more in return. It’s not a difficult concept. Ann had purchased the following deal on some new discount site I’d never heard of called Double Take Deals. Look closely and tell me if it follows the same formula as the rest. With this DoubleTake Deal, get festive with $50 of Christmas decorations including wreaths, greens, ornaments, figurines and more for only $25. So if I read this right, we would get $50 worth of merchandise and only pay $25 for it. Am I right? It’s not that convoluted, is it? After looking this Barcana place up online (and laughing at what seemed to be a Geocities-hosted website), we headed down there and looked around for a bit. It was our first time there and admittedly, they do have a great selection of decorations, so much so that we had trouble deciding what to buy. In the end, we decided that the tree would have a candy theme this year so we stocked up on candy-related decorations and placed them in the basket. Once finished, we waited in line to pay and were pretty excited with all the stuff we had found. Ann started off by handing the cashier her Double Take Deals voucher which she would apply once she was done ringing everything up. Our total was $64.30 which, once our $50 was applied, would mean we owed only $14.30. Hey, we made out alright. “So your new total is $39.30,” the cashier said. Ann looked puzzled. She glanced over at me and I started to think, “That’s way too much.” Ann then asked her if the discount had been applied. She went on to explain that the discount had been applied – all $25 of it, which makes absolutely no sense whatsoever. Why would I spend $25 on a voucher that I’m going to use myself to only get $25 credit in the store? Isn’t the point of getting such deals is to, well, get more for less? Otherwise, it’s like we just bought $25 in Disney Dollars. This is not how it works. As we continued to try and explain things to the cashier, she defended her position. Another one even intervened, condescending attitude and all, and spoke to us like we had just fallen off of the turnip truck. This is not how it works. So what did they not word properly? The only thing that I could think of is that we’d get $25 off with a minimum $50 purchase which this offer does not state either on the website or voucher nor is that a savings of 50%. This is not how it works. We feel conned and totally ripped-off by what transpired. Our only recourse is to contact Double Take Deals on Monday and see what they have to say about the matter. I’ve already tweeted my dissatisfaction to them but being their Twitter account was last update in August 2012, I doubt I’ll get a reply. If nothing gets done, then we’re out a hypothetical $25 and will never use them again. But even if they do resolve it and we get the extra $25 to spend at Barcana, it will be our last trip there. I have no time for cashiers talking to me as if I don’t understand what’s going on and talking to us like we were idiots. In this day and age of social media you’d think that people would be a little more courteous, otherwise those they were rude to might blog, tweet, Facebook, leave reviews on Fouraquare, etc. Someone apparently hasn’t learned this lesson and what a huge disappointment this has been. Stay tuned for an update should anything change. UPDATE 12/2/13: After a few days of emails between Ann and Double Take Deals, Ann was contacted by someone at Barcana who indeed told us that the deal was not done right. She has promised to make things right by issuing a $25 gift certificate.